“What genre do you like writing in?” This is a question I was asked two months ago, and it is one I have started to encounter since. Genre is important, to a certain extent, and it is as helpful as much as it is limiting for a writer. As I answered the question, listing (among others) science fiction, realism, fantasy – what came to my head in that moment – a strange feeling came over me as I did so, as if surrounded by imaginary walls being erected as I spoke. It was the first time I became conscious of genre, as never in my life, or for as long as I have been writing, have I thought about what genre I’m writing in or trying to place a story idea into the structure of a given genre. Genre is more helpful for readers, I think, than it is for writers. Genre becomes more apparent as the story evolves and the further we continue to write. Perhaps it is obvious from the outset – a story about dragons must be fantasy, as is a story with vampires supernatural – but genre only refers to specific categories that are defined by characteristics or tropes. Genre does not refer to the story itself. Asking someone what genre they write in is not the tip of the iceberg, it is scratching the surface, for genre tells you barely anything at all at face value. When one talks about a story, a book they’ve read, how does one normally describe it? Does one, A) tell what the story’s about, the story’s characters and their actions, or B) says it is [insert genre here]? Which is more interesting? Which tells us more? Describing Harry Potter as fantasy does little to tell us what it’s about or to differentiate it from countless other fantasy novels. Describing Harry Potter as a story about a boy wizard who goes to a magic school and must fight an evil wizard is much more compelling and tells us a little bit more. Calling The Count of Monte Cristo a swashbuckler or an adventure novel (according to Wikipedia) is fairly accurate, but in doing so loses its other qualities, which is, namely, about a man who is done an injustice and, afterward, his quest for revenge and the consequences, intended and unintended, of his actions by playing God. Sometimes we can easily dismiss a book based on learning what genre it is, before we even give it a chance. I know I have – sometimes, that’s because it’s a genre I don’t really care for (such as horror) but it is easier to dismiss a book based on the face value of a given genre versus making an informed decision whether to read a book or not, after we’ve learned more about it – its plot, what the story is about – and whether that interests us. When we start looking for stories and not just genre, that is when we discover new and exciting things to us, things that maybe we didn’t even know existed or that we didn’t know we could be interested in. A story doesn’t have to be written in just a single genre either. Some of the best stories are ones that combine genres, or elements of them; while not a book, the best example that currently comes to mind is Captain America: The Winter Soldier. At face value, it’s a superhero movie but on another level, it’s a political thriller, and this combination works very well. It is these stories that often have the best dynamics, as, when thoughtfully executed and written well, they are multifaceted and can be approached from many different angles. What genre do I write in? Saying that I write fiction is easy (and this doesn’t make me feel like I’m putting myself in a box), but when asked for more specifics, while I could start listing some of the genres that my stories could easily be categorized as, I try for a better answer. This is my current answer: I write fiction about human nature, discovery and self-discovery, the triumph of good over evil (as corny or black-and-white sounding as that is, as ambiguity/grey area is de rigeur), magic; a romance of a past that never came to be or even existed. That is what I write about, right now. 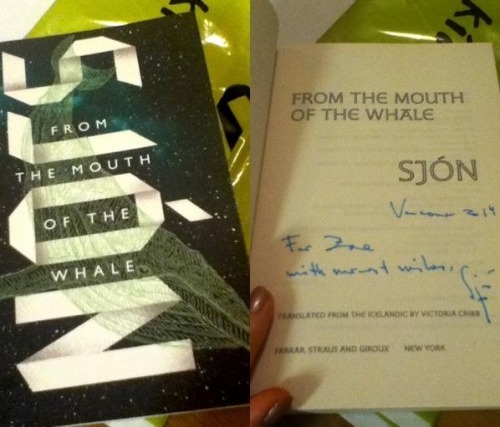 From the Mouth of the Whale by Sjón: This was my first book to read in 2013, although I first came across it in December. I’m not sure how I found out about it, except that I was reading on the Internet. The author, Sjón, is also a poet and has written lyrics for Björk (one of my favourite singers and whom, I think I’m safe to say, I’ve been a lifelong fan of). Translated by Victoria Cribb, it is set in fifteenth century Iceland and the protagonist, Jónas “the Learned” Palmason, is a naturalist who has been banished to eastern Iceland for his practices (which local authorities condemn as sorcery and necromancy). The novel is mostly told through his recollections of various events from his life before exile, including what lead to him being exiled. Written in a stream of consciousness style, it flows like a current as it is allowed to wash over the reader – rather than fight with or against what is sometimes a challenging style to read. Through some research, I found out that Jónas the Learned is based on a real person, Jon Gudmundsson – who is so obscure that it is hard to find any information about him; he doesn’t even have a Wikipedia page – and has close parallels, although what is fact and what is fiction seems to be blurred. Sjón was not the only author present, he was joined by three other European authors (Herman Koch, Karl Ove Knausgaard, and Maylis de Kerengal) and they talked about the state of cultural identity in the wake of globalization, among similar topics. Each author also gave a reading from their book; Sjón read from his book The Whispering Muse (which I have to read still). At the end of the talk and audience Q&A that followed, the authors signed their books. My heart thumping in my chest, I got in line to have my book signed. I was near the back of the line, it shuffled slowly forward and with every slow step, closer and closer toward the table, I held myself close as I started to tremble with excitement and gritted my teeth to keep them from chattering. When it was my turn, I kept myself together enough that I could speak fluidly and told him how much I loved his writing, including his lyrics for Bjõrk, whom I mentioned I’ve listened to since I was a child. I asked him how he had heard of Jon Gudmundsson, mentioning how it’s hard to find anything about him on the Internet and also how I made a mind map, which I saw he was impressed by. (He said he is known in Iceland and that he read what was available and collected pieces as he found them, until he could write a story around them.) At this point, there was only one person behind me but I respect how little time authors truly have at these kinds of things; book signings aren’t opportune or appropriate times to have heart-to-heart chats, so I kept it brief. Our conversation, if it could be called that, probably lasted less than two minutes. He gave the book back to me, signed, and I think I must have gripped it firmly as I left. Once I was a slight distance away, I opened it again and gazed at what he’d written. The ink, which I had perceived as green under the warm yellow light, now appeared blue. I stood as if in a dream, lightheaded and in a daze. I had been shy and near hesitating, torn between whether or not I should, until excitement took over and my realization that if I didn’t act I would immediately regret it forever. I’m glad I did. I’ve been reading Middlemarch and I find myself liking it. In complete and utter honesty, before I started to read it I thought it was stuffy, and this is coming from someone who went through a phase of voluntarily reading classics in my teens. I’ve also realized I don’t really know what it’s about – a fine surprise when reading classics – and I’m resisting so far to read up on the plot on Wikipiedia. I was inspired to read it after listening to Rachel Hartman’s keynote speech at Book Camp and borrowed it from the library shortly thereafter. I didn’t get a chance to thank or to let her know during Book Camp, but recently I did so on Twitter and we had a lovely, brief conversation. I intend to read her book, Seraphina, soon. As I go along, one of the things that strikes me the most about George Eliot’s writing is her use of language; enough that I stop and reread it, whether it’s a passage or dialogue, whether it is witty or a kernel of truth or wisdom. It’s the sort of language I want to remember and reuse myself, when the occasion calls – in other words, quotable. I’ve been charting my admiration for Middlemarch on Tumblr, but I wanted to have most of my favourites (so far) in one spot here. The meaning we attach to words depends on our feeling. But selfish people always think their own discomfort of more importance than anything else in the world. I see enough of that everyday. Young folks may get fond of each other before they know what life is, and they may think it all holiday if they can only get together; but it soon turns into working day. Quoting Middlemarch does not do it justice, no more than reading quotes from it, but it is in the action of writing down these quotes that I express my admiration of this book. It could be compared to watching a movie and quoting memorable dialogue from it afterward; likewise, as I read Middlemarch I have a compulsion to write parts down that move me and that I am compelled to share with others. This was a random thought, and then recurred more frequently during the time that I volunteered at my library’s writing and book camp for children and teens. For one week, we went to workshops led by authors and illustrators, while practicing and honing our writing skills. There is so much I could tell, but I would never be finished as I would keep remembering another story, then another, and another… But if I were to name one thing that stayed with me afterward, it would be the writers that surrounded me during that week. On the last day, there was a gala where some of the campers read from their work. As we all listened to each story, I was struck by the uniqueness of their voices and by their inventive imaginations. Whether they were short pieces, poems, excerpts of a larger work being worked on, I just wanted to keep on listening. “What happens next?” (The readers had a minimum of two minutes to read, maximum three minutes. At two minutes a bell would ring, the kind at a shop when you want to get the shopkeeper’s attention; at three minutes, there would be a cowbell and we were all supposed to shout, “More cowbell, less reading!” The cowbell only happened once but everyone pleaded to have the final paragraph read.) Throughout the readings, my spirit was lifted as the readers – these writers! – inspired me. When we weren’t attending workshops or listening to keynotes, we worked on our writing. And here is when that thought occurred to me – “writers in their natural habitat.” I would look up and see everyone’s heads down, pen (or pencil) to paper; fingers to keyboards, and it amazed me to think that in one space, simultaneously, all of us were in different worlds; each of us creating. Sometimes there would be brainstorming between two people, if not more, in hushed, excited whispers; on occasion, there would be a sigh or groan from someone as they tried to figure out what to write next or what to write at all, but, mostly, the only sounds you could hear were the clicks and clacks of a keyboard and paper being written on. 1. Kurt Vonnegut on the role of writers as modern myth-makers. 2. My sister and I attended a pre-launch of a new, upcoming book exploring how World War I affected British Columbia, Canada. 3. William Gibson on how it’s harder to imagine the past than the future. 5. There’s still a lot of research to be done, but I’ve started writing my WWI novel! It’s Friday, and that means it’s the weekend! Since getting a Tumblr blog, I’ve been posting a lot there. As I realize that not everyone is on Tumblr, I’ve decided that every Friday I’m going to post a links roundup of the most interesting things I blogged about on Tumblr or that were the most popular based on number of likes/reblogs. Think of it as a weekly newsletter! 1. I’m currently doing research for a historical novel I’m starting, set in Canada during World War I. I’ve been tagging my posts with “WWI novel”, as I don’t actually have a title yet. 2. My Dear Bessie, love letters sent between Chris Barker and Bessie Moore during World War II. Their story is beautiful and I’m looking forward to this book. 3. Project Hound: an exciting idea for a book app, adapting the story of The Hound of the Baskervilles by Arthur Conan Doyle. 4. Another Arthur Conan Doyle link, a fan theory about the possible connections between Sherlock Holmes and Edward, the Black Prince. 5. Responsibility of the writer, a tag I’ve created to keep track of inspiring quotes by authors about the importance of writers and their duty. That’s just some of what I’ve posted – head over to Writer’s Bone on Tumblr for more! I’m a big fan of behind the scenes stuff, whether it be movies, tv shows, or books (such as an insight into an author’s writing process, etc.). When I started this blog, I hoped to do more of that but so far, I haven’t. After reading Austin Kleon’s book, Show Your Work!, I thought about this more and how I might be able to show behind the scenes stuff more effectively and decided to get a Tumblr. While I love seeing other people sharing their process, their behind the scenes, out of habit I keep my cards very close to my chest when it comes to creating. But I’m learning when, sometimes, it is okay to share and I’m making that distinction as I share some of my story ideas (things I’m working on, or just thinking about so far) with family members and friends, as well as fellow writers. The Writer’s Bone Tumblr is an extension of this blog and allows me to share things – my inspirations for my projects, quotes from authors I like, etc. – in a way that is freeing. It is freeing in a way that I don’t feel compelled, or obligated, to have to write a proper post in order to just share something – which is how I feel when I post something here or on one of my other WordPress.com blogs, whereas with Tumblr I can post a photo, for example, and maybe I’ll only write one or two sentences, or a basic summary, without it being a full-blown post. I’ll also be using it to tie in to topics that I might blog about here in the future. Tumblr is my notebook, my book of ideas, my commonplace book on the Internet. Keep an eye on the tags! If I post or reblog something that relates to a piece I’m working on, I will tag it accordingly. I’ve been reading Tom Standage’s The Victorian Internet, a book about the invention of the telegraph and in one of the chapters, he details how the telegraph revolutionized the communication of romance, which blossomed over the telegraph much as in the same way it can today with texting and other forms of online communication, and sometimes culminated in marriage. * Long distance relationships and romances had existed before, with loved ones writing letters to each other but, of course, this process was slow and letters could take weeks to arrive, as well as carrying the potential risk of discovery if correspondence was forbidden or, especially in a lady’s case, without permission. People getting to know and falling in love with each other, without ever having met face to face, seems commonplace now and it has provided material for love stories, perhaps the best known being Nora Ephron’s You’ve Got Mail but there is an even older story, written during the days of the telegraph, and mentioned in The Victorian Internet, called Wired Love: A Romance, or Dots and Dashes by Ella Cheever Thayer. Through Mr. Thompson’s blog, I found out that Wired Love also inspired this art installation called “Sounder and Relay” by Silvia Ruzanka and uses excerpts of dialogue from Wired Love. *Marriages were also officiated by telegraph and were legally binding. I actually experienced that recently with a story I’m working on right now. The whole writing process was like that as I really didn’t know what happens beyond the seed of the idea, so I’m figuring it out as I go along. In some ways, this process is kind of like of a choose-your-own-adventure story. A few days after this conversation, I came across an interview from last year with Alan Bradley, the author of the Flavia de Luce series, in which he was asked to describe his writing style and he said that it was “spontaneous”. When I read that, it was as if a little spark of recognition started – realizing that my writing is spontaneous, too. To me, spontaneous writing doesn’t mean waiting for inspiration to strike. In fact, the word “spontaneous” comes from the Latin word spontaneus, meaning “willing, of one’s free will” (Online Etymology Dictionary), whereas the etymological definition of inspiration is “immediate influence of God or a god” (OED) or “divine guidance”. As it is commonly understood, inspiration comes from external causes while spontaneity comes from within. When I’m writing, if I get a different idea – that different direction or angle – and I decide to go with it, rather than putting it aside and carrying on, I am writing spontaneously. I once compared it to improv and I suppose it’s also like when some writers talk about how their characters start talking to them, or do something completely different that they weren’t expecting. For a long time, I thought the notion was rather twee and I tolerated it, though only now – only now – do I think I’m starting to understand. I view this act of writing spontaneously as different from rewriting or editing while you write: editing requires already existing work, whereas spontaneous writing is going with the flow, even if that means you could take a slightly different route to get to where you were headed or you may end up with something else completely different from what you might have had in mind. This post was written and published with Desk PM.